CID-42: A Black Hole Slingshot? An unusual object was discovered in the Cosmic Evolution Survey, a large multi-wavelength study. This object, known as CID-42, is the only one out of the 2,600 in the survey that has two very close compact objects seen in optical light. By combining data from Chandra and other telescopes, evidence is found for a recoiling black hole in the system. Two different scenarios for this possible recoiling black hole are being pursued. Evidence for a recoiling black hole has been found using data from the Chandra X-ray Observatory, XMM-Newton, the Hubble Space Telescope (HST), and several ground-based telescopes. A new paper reports that this black hole kickback was caused either by a slingshot effect produced in a triple black hole system, or from the effects of gravitational waves produced after two supermassive black holes merged a few million years earlier. The discovery of this object, located in this composite image, comes from a large, multi-wavelength survey, known as the Cosmic Evolution Survey (COSMOS). This survey includes data from Chandra, HST, XMM-Newton, as well as ground-based observatories. Of the 2,600 X-ray sources found in COSMOS, only one -- named CID-42 and located in a galaxy about 3.9 billion light years away -- coincides with two very close, compact optical sources. In this image, the X-ray source detected by Chandra is colored blue, while the Hubble data are seen in gold. The two white sources near the center of the image are seen in the optical HST data, but they are too close for Chandra to resolve them separately. The galaxy's long tail suggests that a merger between galaxies has occurred relatively recently, only a few million years earlier. Data from the Very Large Telescope and the Magellan telescope give evidence that there is a large difference in speed between the two optical sources of at least about three million miles an hour. The X-ray spectra from Chandra and XMM-Newton provide extra information about CID-42. Absorption from iron-rich gas shows that gas is moving rapidly away from us in the rest frame of the galaxy. This could be gas in the galaxy between us and one of the black holes that is falling into the black hole, or it could be gas on the far side of the black hole that is blowing away. Taken together, these pieces of information allow for two different scenarios for what is happening in this system and the nature of the two optical sources in the center of the image. In the first scenario, the researchers surmise that a triple black hole encounter was produced by a two-step process. First, a collision between two galaxies created a galaxy with a pair of black holes in a close orbit. Before these black holes could merge, another galaxy collision occurred, and another supermassive black hole spiraled toward the existing black hole pair. The interaction among the three black holes resulted in the lightest one being ejected. In this case, the source in the lower left of the central pair of optical sources is an active galactic nucleus (AGN) powered by material being pulled along by, and falling onto, the escaping supermassive black hole. The source in the upper right of the central pair is an AGN containing the black hole that resulted from a merger between the two remaining black holes. In this slingshot scenario, the high-speed X-ray absorption can be explained as a high-speed wind blowing away from the AGN in the upper right that absorbs light from the AGN in the lower left. 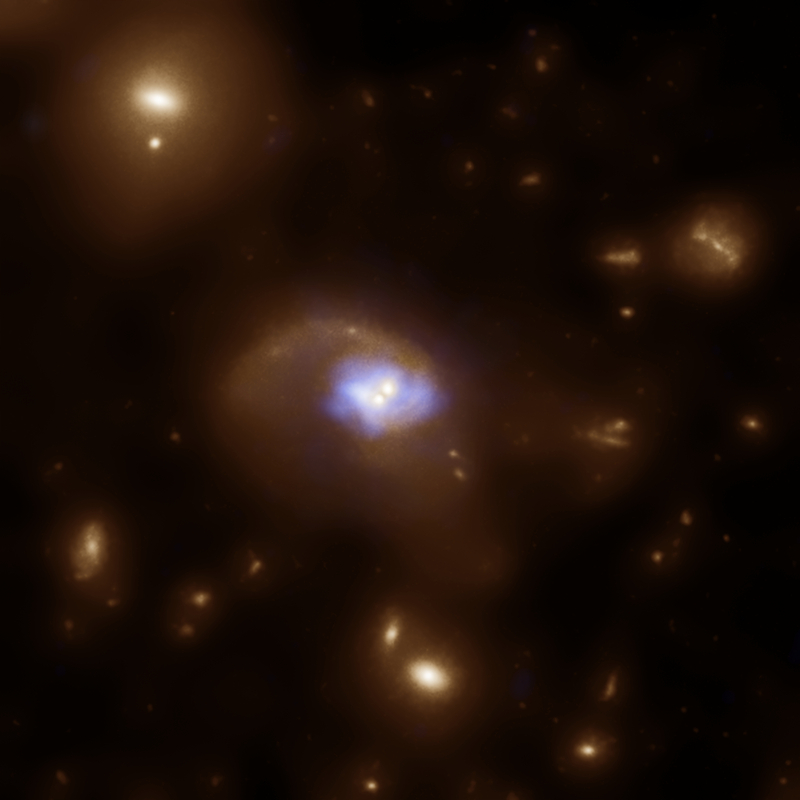 Based on its optical spectrum, the AGN in the upper right is thought to be obscured by a torus of dust and gas. In nearly all cases a wind from such an AGN would be undetectable, but here it is illuminated by the other AGN, giving the first evidence that fast winds exist in obscured AGN. An alternative explanation posits a merger between two supermassive black holes in the center of the galaxy. The asymmetry of the gravitational waves emitted in this process caused the merged black hole to be kicked away from the center of the galaxy. In this scenario, the ejected black hole is the point source in the lower left of the central pair and a cluster of stars left behind in the center of the galaxy is in the upper right. The observed X-ray absorption would be caused by gas falling onto the recoiling black hole. Future observations may help eliminate or further support one of these scenarios. A team of researchers led by Francesca Civano and Martin Elvis of the Harvard-Smithsonian Center for Astrophysics (CfA) will publish their work on CID-42 in the July 1st edition of The Astrophysical Journal. The second scenario, concerning the recoil of a supermassive black hole caused by a gravitational wave kick, has recently been proposed by Peter Jonker from the Netherlands Institute for Space Research in Utrecht as a possible explanation for a source in a different galaxy. In this study, led by Peter Jonker from the Netherlands Institute for Space Research in Utrecht, a Chandra X-ray source was discovered about ten thousand light years, in projection, away from the center of a galaxy. Three possible explanations for this object are that it is an unusual type of supernova, or an ultraluminous X-ray source with a very bright optical counterpart or a recoiling supermassive black hole resulting from a gravitational wave kick. 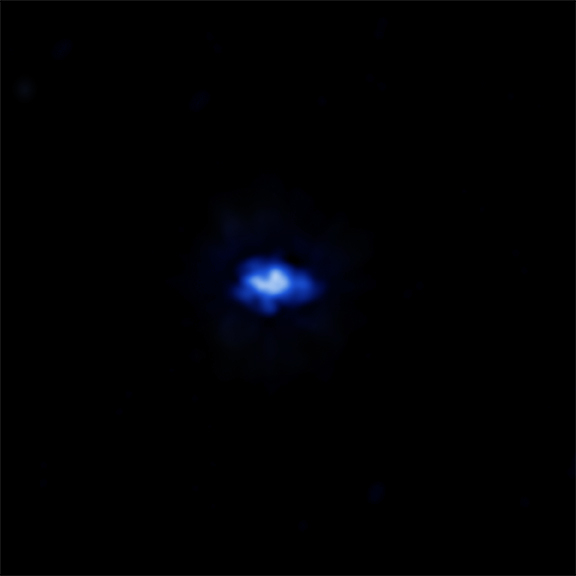 Scale Image is 0.5 arcmin across (about 570,000 light years). Coordinates (J2000) RA 10h 00m 29.06s | Dec +02° 05´ 31.33"
I take from reading this that Gravity Waves are still theoretical. This is a very interesting scenario. Will the escaping lighter Black Hole form another galaxy or is it taking parts of the two emerged galaxies along with it? When the Moon passes through the shadow of the Earth, we see a lunar eclipse. Only the red part of Sunlight, bent by the Earth's atmosphere, reaches the Moon, giving it a vivid coppery colour. This is a great website and I wanted to know more about a Lunar eclipse. Hi, I love your website. This is a good site and I wanted to post a little note to let you know, good job. Hi, thanks for the opportunity to submit. The original posting I received from NASA was lacking one important detail. Luckily though it did include the link to more detailed information on the Chandra website about the image. A source in the Cosmic Evolution Survey field . About 4 billion light years from Earth. X-rays from Chandra were overlaid on an optical image from Hubble. About 570,000 light years across. In the constellation Sextans that straddles the celestial equator.